Establishing a new fantasy story of weight and significance is difficult these days. The genre is crowded with epic quests, adventures, villains and heroes. 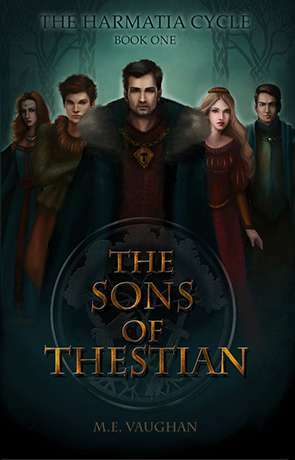 The Sons of Thestian by M.E. Vaughan is fantasy tale by a talented writer that attempts to draw our attention. The opening action sequences are pacey and written with thought, drawing the reader in without the habitual exposition crawl many writers might wander into. We learn of the Nightwatch through Jionathan’s experience of them and come to understand something of the city as Rufus goes about his duties. These are good show not tell choices for the most part and when they stray into tell, they remain relevant to the situation at hand. Where the book struggles is with some of the detail of its plotting. Young Prince Jionathan is ‘destined to rule’ and the Magi Rufus it seems, destined to be part of his life. But Jionathan is determined to run away. We don’t find out why Jionathan wants to run away for quite some time, an extended abeyance that frustrates although there are hints that all might not be quite right with the heir. It is difficult to the character owing to this his and his tendency to push away those trying to help him. Whilst the reveal does come, readers have to make the decision to wait long enough and put up with his unexplained flux in the meantime. Vaughan’s world of Harmatia seems top heavy, like many fantasy worlds in that it concerns itself primarily with the upper echelons of society. There is some consideration paid to the lower tiers, Rufus’ background is particularly lowborn, but this is used to make him stand out as honest and identifiable to the reader. The actual mechanics of the society and how such a vaunted upper class could exist on the back of the subservient tiers below are not given as much thought. The nameless guards in the opening scenes give some indication of this. The more interesting story might be to see how ordinary folk manage in a city where during the night wizards transform into all manner of strange creatures and hunt folk who chance walking down the street. The genre expression shortcuts come thick and fast as Vaughan moves into establishing her heroes’ journey. There’s a lot of ‘provisions’, ‘surveying’ and ‘furrowed’ brows. Unfortunately, this language narrows the appeal of any story and often undermines what we as writers are trying to do. In this case, these shackle the descriptions. When Vaughan writes with her own words, her descriptions are beautiful and she has a lovely economic way of painting pictures in your mind, despite the occasional lapse into redundancy. Crowd scenes have some excellent imaginative detail, occasionally let down by a single flaw, raising reader questions which do not seem to be part of the intention. It is likely this stands out because of the quality around it. Combat is well handled at the beginning of the book, but when it arises later, becomes too mechanical. The shrewd writer uses the emotions and sensations experienced by their character as a base, rather than narrate specific movements, pivots and so on. The investment of the characters in what is happening has to be the priority first, above any accuracy of maneuver. As we move on, the writing settles into a flow with the occasional pothole. There are still confusions in the descriptive images at times, but Vaughan’s characters show variety. The dialogue is wordy but has the requisite ‘vaunt’ of heroic fantasy and the twists of the quest are not obvious. Layer upon layer of schemes are gradually revealed, holding the reader’s interest throughout. The conclusion is a series of surprises for poor Rufus Merle, his life is turned upside down three or more times in the last two chapters. To begin with much of this finale is nicely twisted, providing an unexpected outcome as the story concludes and a sequel premise is established. However, the ride for the reader becomes bumpy as reveal builds upon reveal, one or more of which is not really necessary and could have been kept for the second book. The Sons of Thestian shows promise as a first novel and the experience of writing and editing helps any writer with their future stories. There is clearly more to come from Vaughan’s pen. Written on 15th September 2015 by Allen Stroud.